As someone who works in a tech-adjacent field, I tend to have a lot of friends who work in tech. Recently, many of them have been harping on about how chatbots are the future. I’ll freely admit that I haven’t yet completely embraced the age of the chatbot. But our Walls.io bot Walter makes a whole lot of sense to me. Technically, Walter is not a standard chatbot in that he’s not equipped with an AI and won’t have amusing conversations with you. (Sorry.) Rather, he’s set up to do one thing, and that he does it really well. Post with a hashtag to a social media wall using Walter, the Facebook Messenger bot. 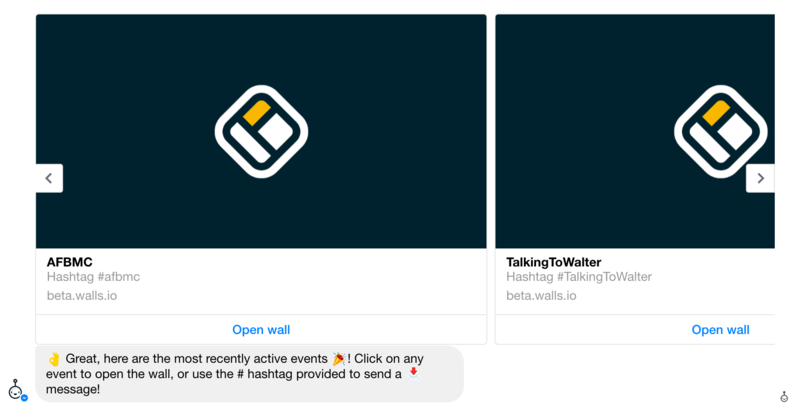 Walter lets you post directly to a Walls.io social media wall simply by typing your message, with the right hashtag, into the Facebook Messenger window. This provides your fans with a brand new way to participate in the conversation on social media. This can be especially helpful and interesting for live walls at events. That way, everyone can easily participate by posting from Facebook Messenger, instead of having multiple apps open. Remember to tell your fans that you’ve added a new way of posting to your social media wall! Walter makes social media campaigns better and more accessible. Not everyone has a Twitter account, and contributing to the conversation from a Facebook account hasn’t exactly been easy since Facebook discontinued their hashtag API in 2015. Walter makes posting from Facebook much more straightforward. 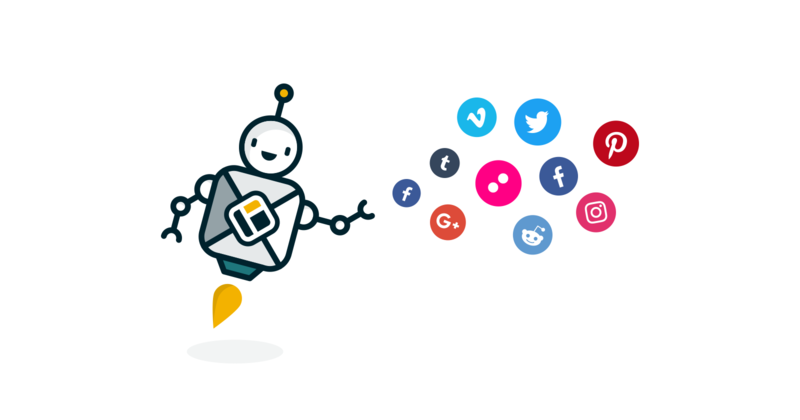 Our chatbot allows people to post messages from Facebook to Walls.io without posting publicly on their own Facebook profile and without having to navigate to a page’s wall to post there. With Walter, joining the social media conversation from Facebook is as easy and straightforward as tweeting is. Talk to Walter. He’s Here for Everyone. 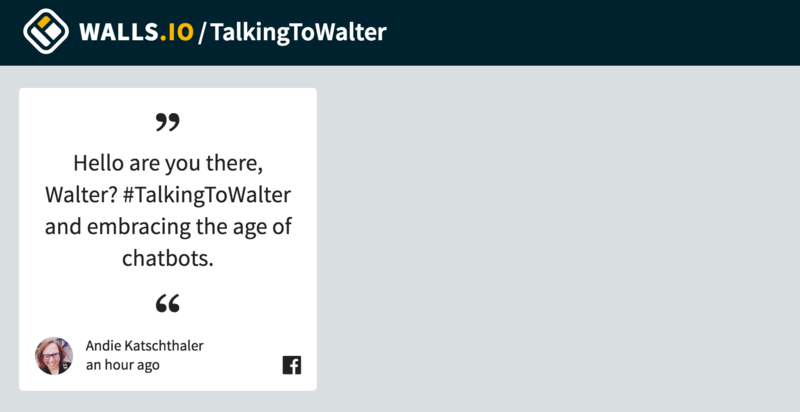 You can talk to Walter by messaging him on Facebook. If you ask Walter for a ‘list’ of events, he will give you a rundown of Walls.io Walls and corresponding hashtags that are currently connected to the bot. Walter is here for everyone; there’s no separate bot for each Wall, but all Walls are connected to the same bot. You can send posts to specific Walls simply by typing your message into the chat window and hitting enter. The hashtag you use decides which Wall your message gets posted to. Enter your message and the right hashtag and Walter will post to the wall for you. Walter will then post your message for you. You can post text-only messages as well as images & videos! And this is what it looks like when Walter posts for me. Setting up Walter for your own social wall is pretty easy. All you have to do is go into your settings and add Facebook Messenger under your sources. Enter the hashtag(s) that you’re using for your social wall. 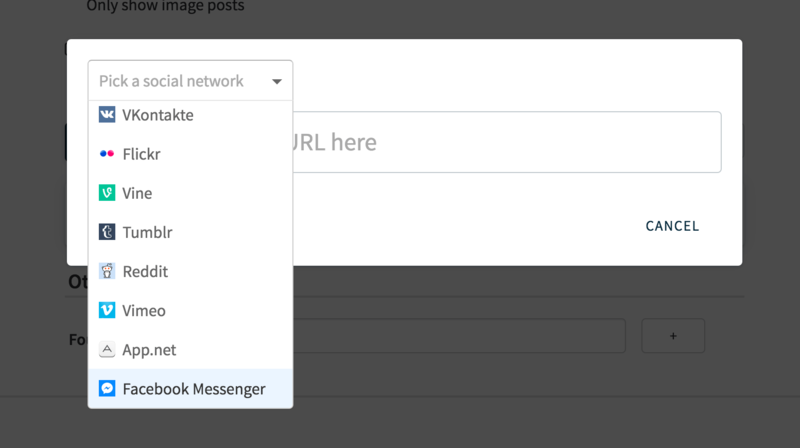 Pro & Premium users can add Walter to their social media wall in their Walls.io sources settings. This is everything that you need to connect your wall to Walter. You can check if it’s live by typing “list” into the chat with Walter and he’ll show you recently active walls. Walter can show you a list of all Walls.io walls that are set up with the bot. Once yours is on there, you’re connected. We’re aware that Walter might be tempting some people into overposting, especially since their posts are only publicly visible on the social wall and nowhere else. So, we’ve built spam protection into the feature that only permits one message per minute. Furthermore, you can always use Walls.io’s strong moderation features to stay in control of your wall. You can use the blacklist to filter out offensive messages and block specific users and you can hide specific messages in the moderation settings for your Walls.io account. Why don’t you start Talking to Walter and let us know how it goes?